Great win on the road for OCSC. Poor Tyler Deric, though. Brilliant saves, makes one howler on a backpass, and costs his team a point. Legit the 3rd or 4th year running where Chicago makes stupid mistakes defensively. They look like a team without any kind of a plan in attack too. Harsh sending off of Justin Morrow for Toronto, but Columbus were the deserved winners. I reckon they'll be near the top of the East by season's end. GREAT win for Dallas. They've started the season off on fire. Utterly atrocious refereeing to award RSL a late peno. The rest of the game was highly entertaining though. Horrendously narrow pitch at Yankee Stadium, but Villa looks the business. Good first win for NYC. New England in pockets played well without the ability to finish, but overall look a shadow of the team that was in the final last season. Another entertaining one. Portland score in the 89th minute only for LA to equalize in stoppage time. Darlington Nagbe is a real talent. Love watching that kid play. Watched a bit of that game and felt so sorry for the keeper! Couldn't watch TFC this week but here's hope they'll finally make the playoffs... I guess an away defeat with 10-men to the Crew is not exactly a huge disappointment, right? Nah, it isn't at all. Like I said, Columbus look to be one of the best in the East this season if they can stay healthy. Plus, generally speaking, MLS teams are awful on the road across the board. I've always put it down to difficult travel combined with a lack of consistent quality. zzzzzzzzz boring, boring, boring. New England still look a shell of the team they were last season, and that was against a 10-man, second-string Montreal. Also three matches now where Juan Agudelo has done very little for them up top. For his sake I hope he can find his feet soon. A little bit more exciting than New England-Montreal and a good point on the road for New York playing at altitude. My early reading of NYC is that their backline, despite 2 clean sheets, is very susceptible. It's so unlike a Jason Kreis team to be that dodgy in the back, but NYC's full backs get little to no support from Velasquez and Grabavoy. Add in that Hernandez and Wingert are no stalwarts, and that's the first area I expect Kreis to dip into the market for. Dallas, man! 9 points from 9 to start the season. Oscar Pareja has built a good side down there and makes good tactical moves. Philly, meanwhile, look a mess. If you get a chance, check out the straight red to Zach Pfeffer of Philadelphia. Horrendous elbow. Bit of a smash-and-grab for Vancouver, but Octavio Rivero's diving header in stoppage time was sick. Wonderful goal, and that's 3 in the 3 for him. Good way to start at a new club! Orlando haven't quite figured out their best attack yet. But when they do, I reckon they're really going to click. Amobi Okugo has flown under the radar for OCSC. Doing a great job shielding the back 4 and breaking up play. More goose eggs, but this was a fairly open game. I was a bit surprised to see Kansas City sign Marcel de Jong at LB when Seth Sinovic has played there for years, but it looks to be an astute move two matches in. Early days, of course. Portland are really missing Diego Valeri. Shame he tore his ACL in the final game of last season. That's a solid point for Houston, especially on the road. Coyle dropped an extra man in midfield, which was a wise choice when visiting the champions. Tyler Deric rebounded nicely and made some big, big stops in the second half. LA will be/should be disappointed with the equalizer they conceded (Robbie Rogers caught ball watching on a corner). I expect Houston to look better once Cubo Torres returns from his loan to Chivas. Good win for RBNY. Bradley Wright-Phillips (yes, Shaun's younger brother!) picking up where he left off last season with a fine goal. DC looked pretty lethargic in the first half and spurned whatever chances they created. San Jose christen their brand new $100 million dollar stadium with a win. I'm really digging the look of Innocent Emeghara for SJ on the left. As for the Fire, sighhhhhhhh. The first time Chicago has ever started a season 0-3-0. Atrocious set piece defending by the Fire on both goals, but at least David Accam made his debut and looked good. There were some good positives, though, so maybe/possibly/potentially they'll get a win at home vs Philly, who looked just as bad this weekend! Minnesota United FC will move from NASL to MLS starting in 2018, 23rd team in the league. Good move for the league. Minnesota has a great fanbase, stadium plan and a decent core squad at the moment. One thing to remember when looking at these results: More than 50(!) players were missing from the league due to international duty. For example, Orlando could not fill out their bench. No joke. MLS wants to sign all these internationals but then proceeds to play through FIFA dates. Clown shoes, MLS. Clown shoes. New England finally off the mark. Solid enough performance by them, and with Jermaine Jones coming back from injury in a little bit, they should start to click a little bit better. The match was played in awful conditions too: Some kind of rain mixed with snow mixed with rain. Totally bizarre 10 minute span. Orlando concedes a silly penalty which Montreal score. Jack McInerney then scores a beautiful chip (check it out: http://www.mlssoccer.com/video/2015/03/28/goal-jack-mcinerney-beats-out-donovan-ricketts-high-flying-rocket) to give Montreal a 2-0 lead. And in less than 3 minutes, Orlando not only pull one back, but they equalize! Kaka was a total catalyst in that, getting an assist then a goal. I know I shouldn't be shocked that a former Ballon d'Or winner is class, but he still looks class. Honestly, New York was due a loss and Kansas City was due a win, so this made perfect sense. Ike Opara had been getting on the end of a number of crosses so it was only a matter of time before he finally scored hah. Good win for KC on the road at Yankee Stadium. Chris Pontius with a late winner to give DC a massive 3 points. The skill by Nick DeLeon to set the play up was pretty. LA don't look like they're clicking just yet. But they'll be fine thanks to their manager, Bruce Arena, who is the best in the league. Oh and they have some guy named Steven Gerrard coming. RBNY! Big road 3 points, and they've taken 4 points on the road at Kansas City and Columbus -- not easy to do. Jesse Marsch has this side playing very well, which is no small feat considering NY stupidly fired Mike Petke and completely pissed off the fanbase. I've probably been the most impressed by them in the Eastern Conference. Robert Earnshaw (remember him? ) comes off the bench and scores a late winner. Portland have been brutal to start the season, but at least Adi has looked pretty good up top. Vancouver with 9 points from 12 to start the season, which is damn good from them considering how strong Western Conference is. Gotta build up all the points you can. zzzzzzzzzzzzzzzzzzzzzzzz zzzzz Colorado's winless and goalless streak continues! haha Houston look clueless. Is Cubo Torres really going to make THAT big of a difference? F**k me sideways, we won! And we actually looked halfway decent, especially in the first half. Thankfully, Philly look just as crappy as the Fire do -- they didn't have a single shot on target against the team sitting in dead last going into the fixture. Yikes. Late drama in this one too. Toronto equalize in the 88th minute. RSL score the winner one minute later -- that's so Toronto! -- through 19-year-old Jordan Allen. Toronto should be gutted after that. Kaka and Gerrard in the MLS, not bad that. Toronto is coming to Chicago this Saturday, so I'll get to see them up close. Both sides should be full strength too. You know how they always say if you don't finish your chances you get burned? Yep, that's what happened here. Orlando couldn't finish the bucket-loads of chances they created (some good saves by Hamid to be fair) and then DC gets a late free kick that Luis Silva puts over the wall and into the bottom corner. Second time this season Orlando got stunned at home in stoppage time. HA! Some bad keeping in this, but an unexpectedly exciting match. Chicago are looking a lot better -- much better than even a few weeks ago -- and some of the new players are starting to bed in nicely. Nobody heard of Joevin Jones when the Fire signed him, but I've been impressed with his play at LB and even LM. As for Toronto, Giovinco showed up (what a talent!) but the rest of that team is a bit sh*t. It's hard to judge them, though, considering they won't play at home until May 10 due to stadium renovations, and in a league with poor travel, Toronto are getting shafted a bit with their schedule. 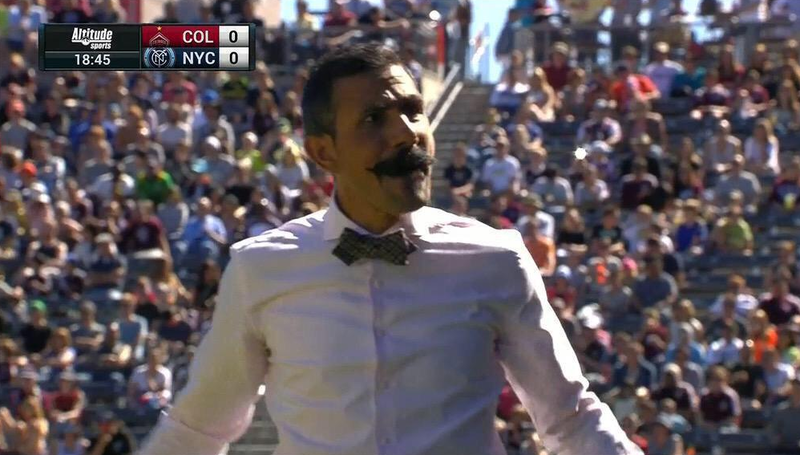 Colorado are sh*t. Their goalless, winless streak continues. At this pace, I hope they set the record. Now that Lee Nguyen is back for the Revs, New England are starting to click. Moving Agudelo wide instead of playing him as a 9 seems to work for them as it gives him a little bit more freedom. Obafemi Martins and Clint Dempsey are the best strike partnership in the league, bar none. I was surprised, in a good way, by how Houston played. Teams usually try to hunker down when they go to Seattle, but to their credit, Houston attacked and tried to play some football. It should be interesting to see how they look once Cubo comes in. Vancouver? Vancouver! First place. They look legit in the early going of the season. Rivero with another goal, and DiegoLFC's new favorite Pedro Morales had a great game. I'm not sure how many knew this, but back when Paul Dalglish was coaching the Austin Aztecs, he was really big on this young kid he had there, Kekuta Manneh. Manneh's been superb to start the season; such a threat down their left side. The Galaxy, meanwhile, have NOT looked good to start the season. They usually start slow, though, and I thought they really missed Jose Villarreal, who was a late injury scratch. ...will forever be known as "Tissue Gate" The two managers, Caleb Porter and Oscar Pareja, were going at it the whole game, and at the end, Pareja offered Porter a tissue instead of shaking his hand As for the game itself, great win for Portland and a bad one for Dallas. The Western Conference is going to be so tight by season's end. Check out Javier Morales' volley. Sick goal. 3 points for RSL was pretty much expected in this one, so job well done for them. One thing about San Jose though is Dominic Kinnear's seeming refusal to play Tommy Thompson, even in garbage minutes at the end of games. Yeah, he's 19 years old and raw, but the kid has a lot of potential and plays well for the US u20 team. INSANE final 10 minutes. Philly has the chance to go up 3-1, have a breakaway, hit the post, miss the follow up. KC equalize in stoppage time through Anibaba. And then Krisztian Nemeth -- Krisztian f**king Nemeth -- scores the winner like 2 minutes after that. M'bohli is easily the worst keeper in the league. He is atrocious for Philly. Some midweek action last night. It was a pretty entertaining game, Kamara gave Columbus the lead twice, only for them to get pegged back by Rivero (again!) and Mattocks. Probably a much better point for Columbus than Vancouver considering it was on the road and with something of a makeshift backline. I'm really liking the look of Vancouver's LB Sam Adekugbe. Just 20 years old and loads of pace down that side. And Montreal made it to the Champions League final, right? America will probably beat them but who knows?! Yes! Just barely. They had a 2-0 lead, lost the second leg 4-2, but advanced on away goals. Truthfully, Montreal is crap and the CL final might end up being a very lopsided scoreline over the two legs (CONCACAF has the final over two legs, don't know why). America scored 5 goals in 32 minutes last night! Copa Libertadores is a far more entertaining competition. It's so unpredictable! Liga MX pretty much has a monopoly on CCL. I really thought Salt Lake were going to pull the upset over Monterrey in 2011, but they fell short on aggregate, 3-2. F***ing hell, Colorado! How you go from looking hopeless at finishing to putting FOUR passed one of the league's better teams at their own ground is MLS in a nutshell -- so unpredictable. Dallas looked unstoppable a few weeks ago, now not so much. Last year in the playoffs, this was a total mismatch with New England hammering Columbus. This one turned out as expected though with some of the moves made by the Crew. New England finally got Jermaine Jones back from injury, which is a good sign for them. He completely carried them after joining in the second half of the season last year. Hey there, Philly! Stoppage time winner to give them their first win of the season and in which keeper Rais M'bolhi isn't even named in the squad (easily one of the worst signings in MLS history). Villa scored with a lovely touch to equalize at 1-1. I guess DC found out a 2-0 lead really is the most dangerous (or at least true in this case). Really solid comeback from New York, responding to DC's second goal within a few minutes, and snatching a late equalizer on a rebound. Good match between two teams that should be near the top of the East come season's end. Ooh wee, Houston, dropping the hammer on Montreal. Montreal, in my opinion, are probably the worst team in the East, so this result isn't terribly surprising. But the general vibe from Montreal supporters is they're singularly focused on the CONCACAF Champions League final, so they don't care much. Another scoreless draw in MLS. This season has already had way too many of them. Another upset! Nyassi with the winner in the 75th minute or so to give San Jose a big 3 points. Vancouver were pretty off -- which is another thing about MLS: Teams can't seem to be able to play 2 matches a week. For some bizarre reason, both teams were wearing their away kits. As for the match itself, a very clever Cyle Larin goal gave Orlando the lead (he chested a cross in at the near post). It took Portland far too long to get any kind of attacking rhythm going, but by then Orlando put Rivas on and his pace instantly won them a penalty, which Kaka got two bites at due to encroachment. Another pretty good result for Orlando, especially at a ground as difficult as Providence Park. You wouldn't think it was their first season in the league. As close to being a heavyweight bout as there is in MLS. Always a great fixture. Seattle started brilliantly, but LA took the lead through Alan Gordon a few minutes after Jaime Penedo made his third or fourth quality save to keep the match scoreless. It was basically all Jaime Penedo from there on out, too; he was outstanding. I really don't understand the MLS schedule. Toronto did not play this weekend again? To tell ya the truth, neither do we. Toronto has a weird schedule due to stadium renovation. They won't have a home game until May 10! I know he's not in the MLS anymore, but found a nice interview from Adu. Philly with a late goal to equalize. This match was on a Thursday, the day after a weirdly scheduled USA-Mexico match, so NYC was missing Diskerud in midfield. Easy breezy for RBNY in this one. They continue to be one of the more solid sides this season. Orlando had a man sent off, but still. They got hammered. Columbus' first really good win this campaign. One of the weirdest things I've seen, that's for sure. Dallas jumped out to a 3-0 lead, then the game is halted in the 41st minute or so and delayed for about 3 hours due to weather. Giovinco scored twice within six minutes, but it wasn't enough. Obafemi Martins scored a sick goal in a relatively easy one for Seattle. A couple of red cards for Salt Lake in this one. Vancouver became the first Canadian side to win at RSL, which is impressive in and of itself. LA back on track after that big win over Seattle last week. This was another big win. Philly took the lead on an excellent free kick, but NE capitalized on a few lazy moments and got the win. Good for the Revs, bad for the Union. NYC punished for being so wasteful in the first half. Portland got the winner in the 80th minute and it was no surprise to see it was Darlington Nagbe who started the sequence for the goal. Class player when he's up for it. Whats the go with Portland Timbers? Everytime I flick channels they seem to have full capacity stadium and a good atmosphere. Do they do that timber chopping thing at every home game? Yes, they saw off a piece of log every time a goal is scored. They probably have one of the best atmospheres in the MLS. Toronto seems to be jinxed haha. Weird schedule, even weirder games, combining for a poor start to the season, although their squad seems to have potential.